I was almost four years old during the Blizzard of ‘78. I don’t remember much, other than playing in the snow in our front yard, and mom and dad taking turns using the snow shoes they had once purchased as a souvenir. The snow started falling Friday around noon, and didn’t stop until Sunday morning. I never bothered to check the snow depth in our yard, other than to confirm that it was about calf-high on me in most places, but I’ve heard reports between 15 and 20 inches around town. I shoveled the walk Friday evening, and laid down a scattering of salt, to help stave off additional work Saturday morning. Our neighbor was doing the same, and we shared warm conversation between breaks in our labor. Saturday morning the kids were up and frolicking in the snow almost before I reached the bottom of the stairs. I suited up for the weather, and joined them outside. I shoveled a fresh path along our sidewalk, and neglected completely to dig out the cars from the driveway, before ambulating over to the neighbor’s across the street. 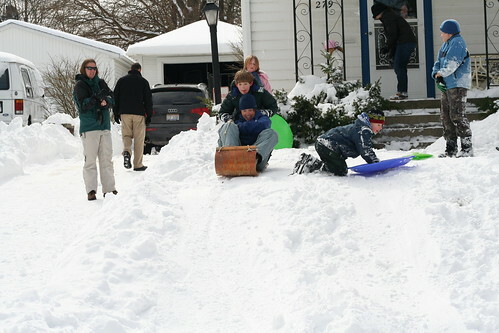 A collection of kids (most of them kids and grandkids of the neighbor) were collecting at the top of the hill, preparing to turn it into an Olympic-caliber bobsled run! 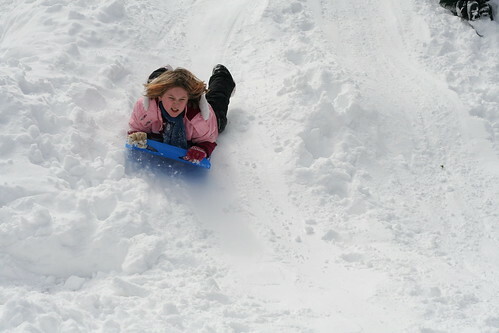 The kids spent several hours sledding on Saturday, and again on Sunday. A good time was had by all. The entire weekend reminded me why I’m so glad to live in the neighborhood we do, as kids played together, adults chit-chatted, and neighbors helped one another extricate cars, remove snow from porch roofs, and in general helped one another.